The grass will never grow under Carolanne’s feet (though if it did, she’d probably put it in a pesto!). 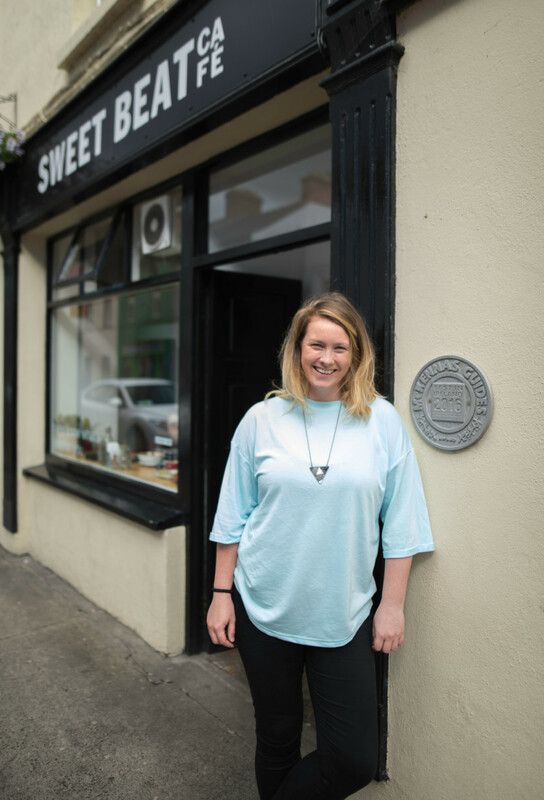 This whirlwind of activity runs the award winning plant based café Sweet Beat on the banks of the Garavogue in Sligo. 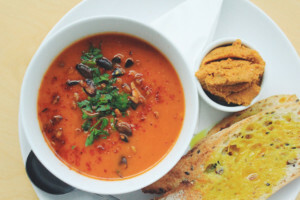 Going from running a market stall on her own to employing 15 in Sweet Beat in just two short years, Carolanne is proving that plant based cuisine can taste great. Originally from Dublin, the family moved to Sligo when she was just eight, prompted by her father’s job. Living in Strandhill with beaches and surfing led to an idyllic childhood but Carolanne had itchy feet. As soon as her education was over, she was on the first plane out. Teaching in Qatar was her first stop and she spent two years in the Middle East. Hampered by the language and local conventions, it was difficult to escape the ex-Pat community and see the ‘real’ Qatar. Carolanne’s solution was through the local food: she began blogging and exploring through visiting the local souks. This was the experience she sought – piles of aromatic spices scenting the night sky, the evocative music of the oud (a guitar type instrument) while sitting outside in the souk sipping one of their delicious non-alcoholic cocktails. The location also gave wonderful travel opportunities like summers in the Himalayas, training to be a yoga teacher. Moving to Perth, Australia, was like going back into the ‘real world’. Working in an office by day, she continued exploring food and blogging. Happiest in the kitchen, she found baking particularly therapeutic. On a visit home she was convinced to sign up for the Ballymaloe 12 week training. To say she loved it is an understatement. She enthuses about the teachers and the philosophy. She recalls how in the early mornings while the cows were being milked and the salad leaves picked, she would go into the kitchens for a little extra coaching, making sourdough breads. The communal lunches were a daily treat with everyone including the venerable Myrtle Allen joining in. Once finished, she moved back to South Africa taking a market stand and selling her baking. Challenged by a friend to try something more demanding, she turned it into a salad bar, and that’s where the magic began. Combining all she had learned in Ballymaloe, Australia and the Middle East, she created flavour sensations in her Super Salads. Using local was important to her – and easy when papayas and coconuts grew down the road. The Kale Pesto she now sells in SuperValu came about when a friend had an excess of produce and it was an immediate hit. After 18 months she came home to Sligo and ran a similar style of stall at the Strandhill Market under the Green Warrior brand. A year later the premises that is now Sweet Beat came up for lease and the rest is history. It’s been a revelation for many committed meat eaters. Just food that’s good for you, as Carolanne puts it.